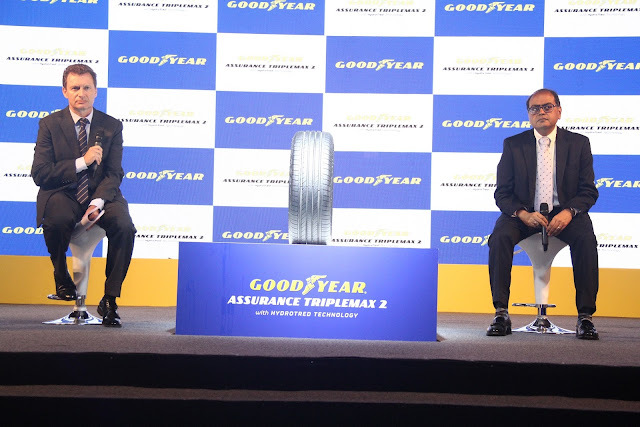 Bengaluru, 17th July, 2018 – In conjunction with Goodyear’s 120th anniversary, Goodyear India today announced the launch of Assurance TripleMax 2 for the mid-passenger segment. Assurance TripleMax was first launched in 2015 in Indian market and has won the trust of car manufacturers and consumers. Assurance TripleMax 2 is the successor version of the current Assurance TripleMax and is designed to improve the safety and durability of the tires. In addition, it is also optimized for excellent grip performance with short braking distance under wet road conditions, enabling drivers to stop faster and drive safer. Assurance TripleMax 2 also provides superior ride and comfort. · Excellent Wet Braking Performance: Innovative compound formulation to increase stickiness and the optimized microstructure delivers better grip and braking performance in wet road conditions. · Enhanced Handling Performance: The new HydroTred Technology with optimized footprint and more effective contact pressure delivers an enhanced driving experience with better tire cornering power and steering precision. · Improved Comfort Performance: Innovative tread pattern is designed to minimize pattern noise throughout tire life, providing a smoother and more comfortable drive. · Resistance Performance: Additional technical features on the sidewall and construction design and materials are introduced to Assurance TripleMax 2, in order to increase resistance to sidewall impacts. Goodyear is one of the world's largest tire companies. It employs about 64,000 people and manufactures its products in 48 facilities in 22 countries around the world. Its two Innovation Centers in Akron, Ohio and Colmar-Berg, Luxembourg strive to develop state-of-the-art products and services that set the technology and performance standard for the industry.